1.Strong license file and unlock key encryption. 2.Flexible license file content. It allows you to create different license types that fit your needs using 17 different validators and unlimited number of the custom fields. 3.Custom license fields. It allows you to store any additional information in the license file, so you can lock/unlock some features of your product, or make some additional tests to validate license. 5.Time/Usage Limited Evaluation. 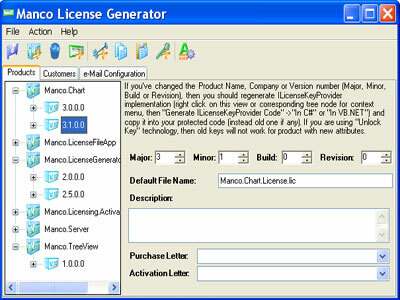 Manco.Licensing System allows you create evaluation version of your product that is limited by running time (you can set expiration date or number of days before license expiration), number of runs or some features of the product. 6.Signed license file. Manco.Licensing system uses strong RSA encryption to sign license files. 7.Activate by Unlock Key. Use strong RSA encrypted unlock keys to activate your application or control. Protection! Licensing Toolkit delivers powerful feature-rich licensing solution. Qweas is providing links to .Net Licensing Pro 6.1 as a courtesy, and makes no representations regarding .Net Licensing Pro or any other applications or any information related thereto. Any questions, complaints or claims regarding this application .Net Licensing Pro 6.1 must be directed to the appropriate software vendor. You may click the publisher link of .Net Licensing Pro on the top of this page to get more details about the vendor.